Now that's we've had a chance to recover from the holidays, the Inventables team put together a quick roundup of our favorite projects of 2014. What was your favorite project? Share it in the comments and we'll compile a list of our customer's favorites for next week. 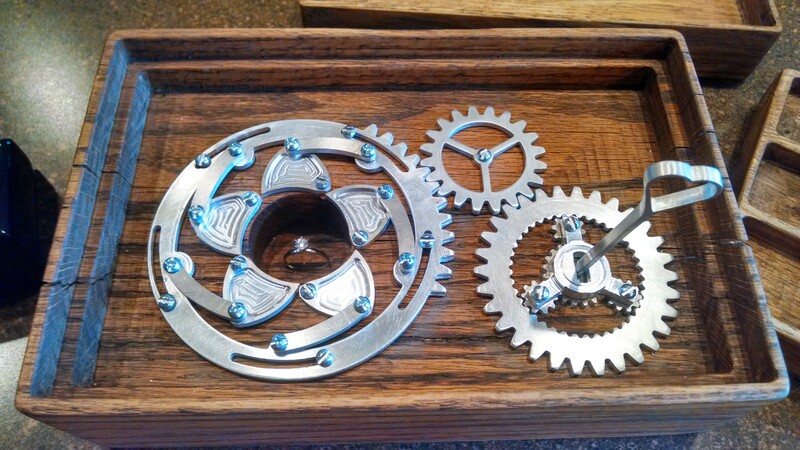 Engagement ring box by Joe Ternus. This project went viral and for good reason- it's beautiful, it's a heartwarming story, and it was all made using one of our desktop 3D carving kits. Photos of the design and building process here. Bar Mixvah bartending robot by Yu Jiang Tham. Uses 3D printed parts, peristaltic pumps and an Arduino to make custom drinks, with in iPad interface. Full blog documenting the build here. MDF laptop stand by our own Paul Kaplan. A 3D model from 123D Make that was sliced into carveable 2D shapes and cut with Easel. Instructions to slice your own 3D models or make this laptop stand here. 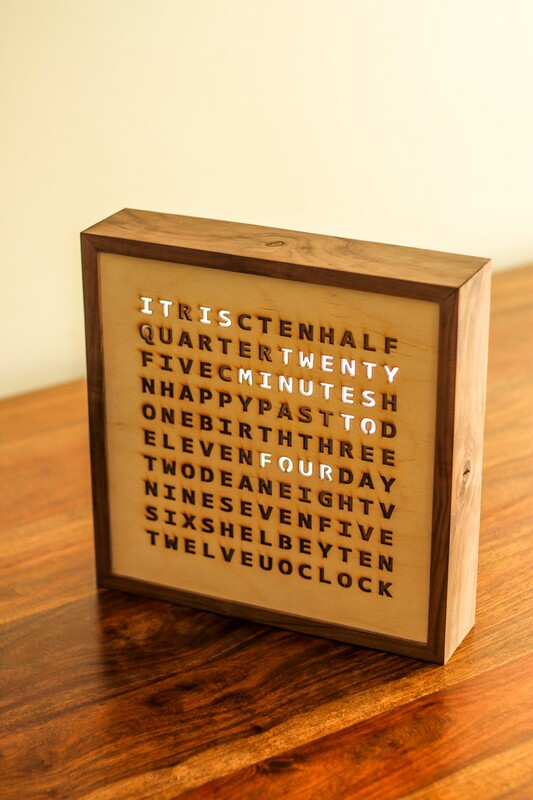 Word clock by buckeyeguy89. It lights up to tell you the time in a more prosaic format, and once a year it turns rainbow colors to with his brother and sister-in-law happy birthday. Full instructions in the imgur album. Lightning box by our own Jim Rodovich. It's a two-sided box with mating halves, made on a desktop 3D carving machine. Instructions to make your own located here. RepRap Wally by Nicholas Seward. Unique DIY 3D printer design that uses a tri-polar coordinate system for motor control. Full development discussion on the RepRap forums here. Monogrammed box by our own Tait Leswing. Super easy to make, instructions here. Our customer Martin P. made an awesome bit of custom software and tutorial for height probing using the new features in GRBL 0.9, for measuring variance in the surface of a copper board before milling a PCB. This is some legit work that solves a real problem! Full blog post here. So what was your favorite? Wanna how off something you're proud of? Post yours in the comments below and we'll feature them in the next blog post.